The long tradition of making Murdick's Mackinac fudge is not as easy as it looks. Fudge moves faster than you’d think. 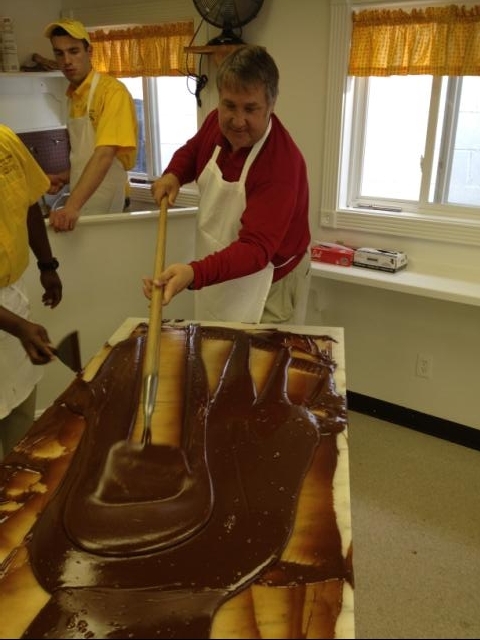 But so does Bob Benser Jr., who, in his mid-40’s, has the duty of running the 125-year old Murdick’s Fudge stores on Mackinac Island and Martha’s Vineyard. Benser put me in an apron and handed me a long, hoe-like tool so I could try keeping a fresh, 30-pound blob of hot, double-chocolate fudge from roaming off of a flat, marble table before it cooled into a manageable, sliceable loaf. Like a plate-spinner, I ran around the table trying to keep up with the delicate yet urgent task. “Some people get the knack, and some never do,” Benser admitted with a smile, while customers in the quaint shop looked on with curiosity. With 19 various fudge shops Mackinac Island has become synonymous with the rich delight. The unmistakable aroma of copper vats bubbling with chocolate waft from the shops lining Mackinac’s main street, perfuming the otherwise nose-crinkling scent of the island’s equine transportation. With no cars allowed on the historic tourist island nestled between Lake Huron and Lake Michigan, Benser, who says he eats fudge every single day, gets to work the confection off by hustling between his three Murdick’s locations and his other downtown properties, a few of which are the Chippewa Hotel and its’ famed waterfront Pink Pony Bar and Restaurant; Lilac Tree Suites and Spa; and Island Slice Pizzeria – filled, by day, with school-aged kids and the post-bar crowd by night. His other businesses rent bicycles and scoop ice cream, too. Benser and Grand Hotel president Dan Musser grew up on the island but were too busy learning their respective family businesses to chum around together. By coincidence, they both attended Albion College and now represent the new era of island entrepreneurism, tourism promotion, and stewardship. Benser currently serves as president Mackinac Island’s tourism bureau, and, by shipping gift packs of Traverse City Cherry, Maple Walnut, Chocolate Peanut Butter, and, this season, Triple Chocolate Espresso fudge flavors worldwide through www.Murdicks.com is an ambassador for Michigan tourism.